Whether you describe “Hot Weather” as 80 degrees or 110 degrees, if you are riding for several hours in heated temperatures, the main thing to prevent is also the most obvious: DEHYDRATION. Dehydration is excessive loss of water from the body. Motorcyclists should not think too lightly of this malady. What’s the easiest way to tell if you are dehydrated? Well…OK…that’s true: you should definitely drink water when you are thirsty. But there are riders who are so used to ignoring their body’s thirst signals that there’s another way: check the color of your urine. A DARK yellow color indicates you are dehydrated. Which means you are well past the point of not drinking enough water. Heat Cramps: If you feel cramps in your legs or abdomen, you need water. In fact, you’ve passed the point you need water. And things are going to get worse until you get some of that H2O. 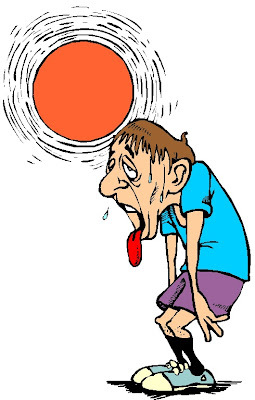 Heat Exhaustion: If you kept on riding in spite of the cramps, or even if you didn’t experience cramps, but are riding beyond your body’s normal need for water, you are now motoring into the realm of becoming a prime candidate for heat exhaustion. Some of the symptoms that you may expect include lots of sweating, headaches, nausea, dizziness, weakness, tiredness and even fainting spells. Obviously these are the kind of symptoms that can badly effect your motorcycle control and reaction time to routine threats to motorcycle survival. So, “Heat Exhaustion” means “bad” news for bikers. Heatstroke (also known as sunstroke): To put things in proper perspective, heatstroke is a medical emergency and the person should be taken to a hospital. This is well beyond the stage of feeling uncomfortable simply because it’s hot out. Signs to watch for include rapid heartbeat; rapid breathing; confusion or incoherence; blanking out; hot, red, dry skin; elevated body temperature; and even hostility (more so than normal for any of your easily aggravated companions). Note that the rider has now passed the sweating stage. The dehydration is so advanced that there is not enough water in the body to perspire (which is the normal way the body cools itself). A rider experiencing heatstroke might even appear to be intoxicated. As heatstroke continues to advance, the face may change colors, moving from red to a pale or bluish tint. Unfortunately, if heatstroke is this far advanced, things can still get worse, including the failing of body organs accompanied by unconsciousness and coma, and in rare circumstances, death. In short, you don’t want to come near the possibility of experiencing heatstroke. It’s worth re-stating that you don’t want to get yourself anywhere near the point of heatstroke. However, if a rider you know does get heatstroke, you need to help them fast, no matter what objections they may offer: Their body temperature must be lowered immediately. Begin by getting the rider out of the sun, and ideally into some air-conditioned area. Their clothing should loosened and/or removed to allow more ventilation. Even better would be to get the rider into some cool water, such as a bath, or even a lake or river if such is possible. Drink lots of “water.” WATER is emphasized since refreshments like soda, coffee (or any caffeine drink) or alcoholic drinks can actually contribute to dehydration, instead of helping to alleviate it. Insulate your skin from the heat. It may seem counter-intuitive to wear protective clothing on a hot day, but you NEED to cover your exposed skin. Think of the desert nomads that spend their whole lives traveling in the desert with their camels: They ALL wear garments that cover their entire body and head. In real simple terms, exposed skin on a hot day is not only subject to sunburn, but bare skin soaks up MORE heat from the sun. If the outside temperature is higher than your normal body temperature (36.8°C or 98.2°F), and if your bare skin is exposed to the heat, your body temperature has no where to go but up. On the other hand, if your skin is covered, you are insulating yourself from the heat. It may “feel” good (particularly on shorter rides) to take your jacket off on hot days, but it is pushing your body into the range of dehydration symptoms even faster. (Of course, riding without proper motorcycle gear on a hot day could also result in considerably more severe circumstances should you take a tumble on searing asphalt with bare skin or without a helmet). If you are riding in areas of low humidity, for example, in the deserts of the American Southwest (or any place that is hot and “dry”), you can cool yourself by dowsing your cotton shirt with water and zipping up your jacket on top of it. Your closed jacket will keep your shirt wet, longer. Of course, if you happen to be wearing a mesh jacket, you can feel quite comfortable for only a little while, as the water evaporates from your shirt under the mesh quite rapidly. In other words, it won’t take long before your shirt is thoroughly dried out and you need to do it again. Now, if you try this in a part of the world that is hot “and” humid, then you will simply be hot and wet with this tactic. True! Especially with the tricky weather here in the Philippines! Biting cold one moment, scorching hot the next.